The BMW 760i was recently unveiled to a group of select buyers who had a chance to marvel at the next step in sophistication for the series 7 line of the iconic BMW brand. Let’s take a look at some of the surprises and updates you can expect when this car hits the market later on in the year. The 760 maintains the 7 series look, but comes with an addition of LED accents and a better and sophisticated mix of style, luxury and efficiency, something that the German auto manufacturer has always been known for. 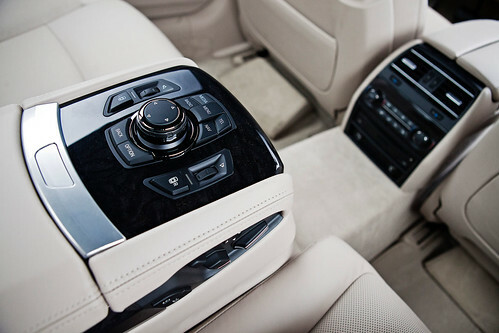 The dark facade of the BMW 760i continues on the inside, as evidenced by the black leather seats and upholstery. The accented tan brown panels and chrome alloy finishes add a touch of luxury that has come to be expected from the BMW brand. The car comfortably seats five passengers, and has a cargo volume of 14 cubic feet, which is adequate for storing miscellaneous items such as large heavy bags for a weekend out of town. The ECO PRO addition is useful for efficient driving given the fact that it enables drivers to cut down on fuel consumption by up to 20 percent. It does this by monitoring pedal and gear recognition and determining when best to change gears. BMW night vision, which is able to pick up on pedestrians crossing the street at night thus avoiding accidents using Dynamic light spot. Multifunctional instrument display that illustrates the different driving experience modes and intelligently customizes the display using different colors. This enhances driver alertness, helping them speed up or slow down when necessary. The driver assistance system, which is comprised of the BMW Head-Up display, projects current speed and navigation instructions onto the windshield, putting them directly in the driver’s field of vision. This enhances concentration and makes for safer driving. In terms of efficiency, the BMW 760i is equipped with efficient dynamics, which enables the driver to minimize CO2 emissions by use of TwinPower Turbo Technology and an array of hybrid solutions. Additionally, the electromechanical power steering provides ultimate control and comfort while driving, due to the fact that it only draws energy when it is needed through switching off the electric motor during long drives. This is a series 7 BMW that pulls all the stops in impressing those who have waited for its debut for a while now, and with an estimated sticker price of close to $120,000, it is worth every penny given the value it will offer to its driver. BMW is known for it’s features and when it comes to the 760i wheel options they have lived up to their expectations. « Driverless Cars: Will Hobby Turn to Lifestyle in the Future?